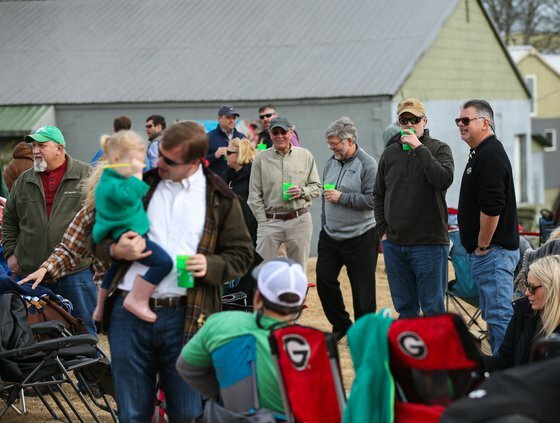 Updated: March 16, 2019, 8:47 p.m.
Gold on the Greenway, benefiting childhood cancer research, came back for its second year with the sounds of a Dave Matthews Band tribute band at the Midtown Greenway Park on Saturday, March 16. The band was joined by the The Ryan Casper Band and The Allen Nivens Band for live music while food vendors like Hop’s Kitchen, Johnny’s Barbecue, Carniceria Tapatia and Frozen Frenzee filled guests’ stomachs nearby. The Tap It beer truck kept the drinks flowing as the night went on, too. The event is hosted in support of the many children in the area fighting cancer. Proceeds from ticket sales and vendors at the event went back to the Rally Foundation for Childhood Cancer Research. Last year, the event raised nearly $400,000 and funded three research grants completely on its own. This year, they hoped to raise even more money and fund more researchers’ work. Grogan works with Molly Johnson, whose son, Riley, 8, was diagnosed with leukemia in 2016. Johnson helped start the Gold on the Greenway event with the help of other families in the area whose children are fighting cancer. Grogan’s wife, Manuela Proni, felt the same way. Robert Meyers stood toward the back of the park with his 1-year-old son, Henry, in his arms. They joined the event this year because Henry was diagnosed with leukemia in August 2018. Meyers was happy to see so many people at the event and was encouraged by the support he’s seen from the community, which in turn helps raise more funds for cancer research. Dawn and Chris Chapman were happy to do their part in bringing awareness to childhood cancer, too. Their daughter, Olivia, needed to find a volunteer opportunity for school, so they chose Gold on the Greenway since it means something a little extra to their family. Their other daughter, Chloe, has Down syndrome and was there with them as they sat on the steps, looking out over the crowd on the lawn.